Browsing the shelves at your local supermarket, I’m sure you’ve noticed the label “organic” on everything from eggs to facewash. The migration of the organic label from food to beauty products might seem baffling. Does it really matter if your lotion was made from organic botanical ingredients? The benefits of using organic beauty products are actually surprisingly similar to the benefits of eating organic foods. Since your skin is your body’s largest organ, why not invest a little more into what you are putting on it? The term “organic” refers to an agricultural process that is designed to conserve water, reduce pollution and improve soil quality. Unlike conventional farmers, organic farmers manage weeds with mulch and crop rotation instead of man-made herbicides. They use natural forms of pest control such as insect traps and beneficial microorganisms instead of synthetic pesticides. These practices both protect the environment and limit our exposure to residues from synthetic chemicals. Companies, like Pure Hemp Botanicals, that follow organic guidelines for their products also do not use unnatural processing aids or fortifying agents such as phthalates and parabens that are common in nonorganic products. 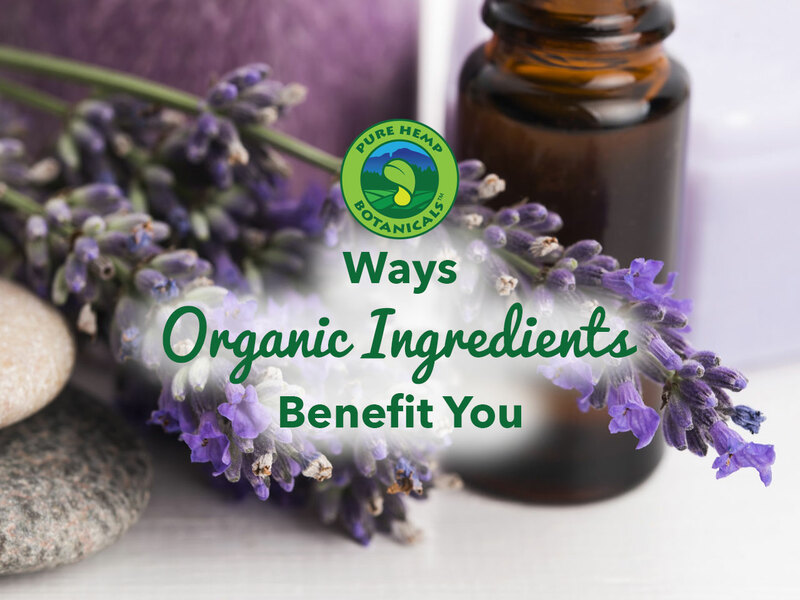 Organic products tend to have less fillers and higher quality natural ingredients because they strive to meet the USDA’s guideline of using at least 95 percent organic ingredients. Even beauty products that are made with conventionally grown botanical ingredients can contain trace amounts of synthetic herbicides and pesticides. Your skin can absorb those toxic traces. By investing in organic beauty products, you protect your skin from these toxins. When you choose to use organic beauty products that only contain ingredients that you can name, you don’t have to worry about what unknown chemicals you are exposing your body to. Natural ingredients also tend to be gentler on your skin and have more long term benefits. According to a study led by Kirsten Brandt at Newcastle University in the United Kingdom published in Critical Reviews in Plant Sciences in 2011, 60% to 80% of organic plants, vegetables and fruits have been found to have a higher percentage of antioxidants by 10% to 30%. Antioxidants are especially beneficial for skin care because they address the damage done by free radicals. Skincare products with antioxidants can minimize fine lines and wrinkles, reduce age spots, increase collagen production and reduce acne according to LiveStrong.com. We are all more aware of the damage that our buying habits can have on the environment. When you invest in organic products you can feel good knowing that you are supporting farmers who are conserving water, reducing pollution and improving soil quality with their positive agricultural practices. Organic beauty products protect your skin – and the environment – from pollutants and also enrich it without the risk of future health concerns. What do you think about organic beauty products? Are you ready to make the switch? Tell us in the comments!